Best Rally-O in Trial - Dumbledeer U Dared Me CCD owned by R, M & P Young. Best Agility in Trial - Ozzispot Xtreme Addikition GD SD SPD JDX owned by T & S Irving. Best Obedience & Best Jumpers in Trial - CH 600 Yarrowfell High Society CD ADM ADO JDM JDO2 ET owned by S J Haynes. 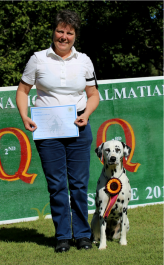 ​"It was a great honour and privilege to be invited to judge this prestigious National Specialty and I must say a big thank you to the Dalmatian Association of Queensland Inc. for hosting and running the show so competently. Everyone worked so hard to make this a very special occasion for the exhibitors and for me too. The venue was excellent with a ring of excellent size, parking was convenient and there was plenty of shade for the Dalmatians..."
What Sports were at National? How many Judges are required for an event such as National? We have 2 judges for the Sports events and 1 conformation International Speciality Judge. How often are Nationals held? Until 2015, a National was held every 2 years, now it is every 3 years. When was the Dalmatian National started? During the 1980s, hosted by ACT. Yes, Brisbane has hosted at least 3 previously. Any person who is a member of their state body and their dog is registered with the ANKC is eligible to enter. However they must be on main or limited register and not the associate register, as per the rules - sorry! Any person is welcome to come and watch the events. The Sports events are held on Friday 5th June, and Conformation held on Saturday 6th June. Canine Control Council of QLD Showgrounds, King Avenue, Durack. Exhibitors from most southern states and made the long trip north for both the sports and conformation events. We also hosted members from Central and North Queensland. When and Where is the next National? 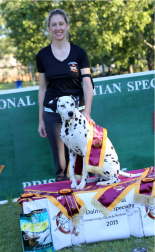 The 16th Dalmatian National will be hosted by the Dalmatian Club of New South Wales IN 2018. Check their WEBSITE for more details.